It’s not a secret. I support Bernie Sanders. I support his platform. I don’t mind debating actual policy with Hillary fans, and I’ve met one or two who actually debate, rather than just blindly follow. Most will debate economic issues, or Bernie Sanders’ existence, but other issues, like immigration, are ignored. I understand. You want to avoid an issue in which Hillary Clinton is terrible. No one wants to admit that Clinton wants to deport children and moms back to violent countries in which they will face even more violence. The simplistic “I support Comprehensive Immigration Reform” line is pretty much ineffective when we have tens of thousands in freezing private prisons and deportations are being stepped up. We want to hear solutions. As Bernie Sanders steps up his game on issues, especially immigration, the Hillary fans are now coming up with new material: We can’t afford Bernie’s ideas; We can’t pass it in Congress; We can’t! In other words, Clinton will work from the middle to the right to convince Republicans, as if this worked for President Obama. The fatalism that has penetrated supposed liberals in defense of their candidate is quite sad. That I first noticed these chants around the MLK, Jr. holiday makes it even sadder. Martin had a dream, remember? Suppose white allies back then told him he couldn’t get all he was calling for. Oh, that’s right, they did. Now, I won’t dare compare Bernie to MLK, but we can agree that ideas of social and economic justice are quite similar. Recently, even Chicano scholar Dr. Jose Angel Gutierrez stated that Bernie Sanders’ platform is similar to that of La Raza Unida Party as he endorsed Sanders. Ideas and pronouncements that brought thousands to Washington, DC and that once empowered and excited Texas Mexican Americans enough to vote in huge numbers are once again being discussed because of Bernie Sanders. Yet, “we can’t”? Now, all of us who want justice are being told to wait our turn, and to elect someone who can supposedly pass (watered down) legislation. If it’s in the same way as President Obama, then we’re sure not building an excited progressive base for 2016. Let’s recall that we had an excited base in 2008 only to return to failed Democratic pragmatism, thus demoralizing said base (I give you the 2010 midterms as an example of what happened). If you want to excite voters, then you must call for what is needed, not for what we can maybe, sorta get, if even that. Let’s excite the electorate and win big, then we can negotiate later with the backing of a committed base. But we need start with what we want. Instead, Bernie Sanders’ opposition seems to want more of the same. And this needs to change. Because “We can’t!” should not be in our political vocabulary as Democrats. If that’s the response to Bernie Sanders, then, spare me. 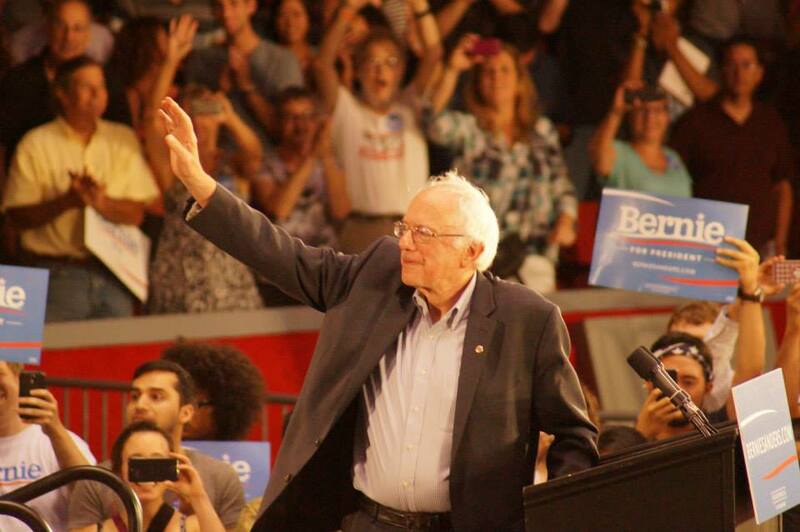 I joined over 5000 of my closest friends and attended the Bernie Sanders rally at UH Hofheinz on Sunday evening and I must say I was impressed in a lot of ways. Sure, I was expecting a great, truly progressive speech from Senator Sanders–even after the weirdness of #NN15–but what I didn’t expect was such an amazing atmosphere. The diversity in the room was notable, if only because I had recently been reading some snark on Facebook by Hillarite friends of mine talking about how “white” Sanders’ events had been. The Houston event, though, blew those notions away. The bottom line: A diverse cross-section of America seems to be listening to Bernie Sanders because he’s saying the right things on most issues, rather than just speaking in one-liners (evident in a one-hour speech). Now, much like Hillary Clinton, Sanders has not provided expanded answers on immigration reform (usual standard stuff), but after Saturday, Sundays venture into racial justice issues hit all the right notes. While Clinton has offered her standard stuff on immigration reform, she also has a record of calling for immediate deportation of children and more deportation judges, so, the negative stuff being tossed about by her fans against Sanders on the issue really hasn’t affected what I think of Sanders. I’m hoping Sanders expands on the issue, as well as Latin American affairs in the future. PDiddie expands on what Bernie said, so, no sense in rehashing the speech. I will provide a youtube of film I took when Sanders began his talk on racial justice and immigration, in case he is still receiving criticism. The good thing about the #NN15 stuff is that, hopefully, Dem candidates will begin to speak on the issue. Ultimately, this isn’t about race or identity politics, it’s about expanding the space that the issues have received in Democratic Party politics (more on that in the future) and actually doing something about these issues. If Dem activists cannot handle it, then we can’t win in 2016. As far as the event, it was good to see fans of Hillary and other Dem activists in the crowd. I think we were all looking for a dose of energy because these are our issues Bernie was hitting on. Primaries are a good thing, nationally and locally, so, let’s enjoy the discussion.